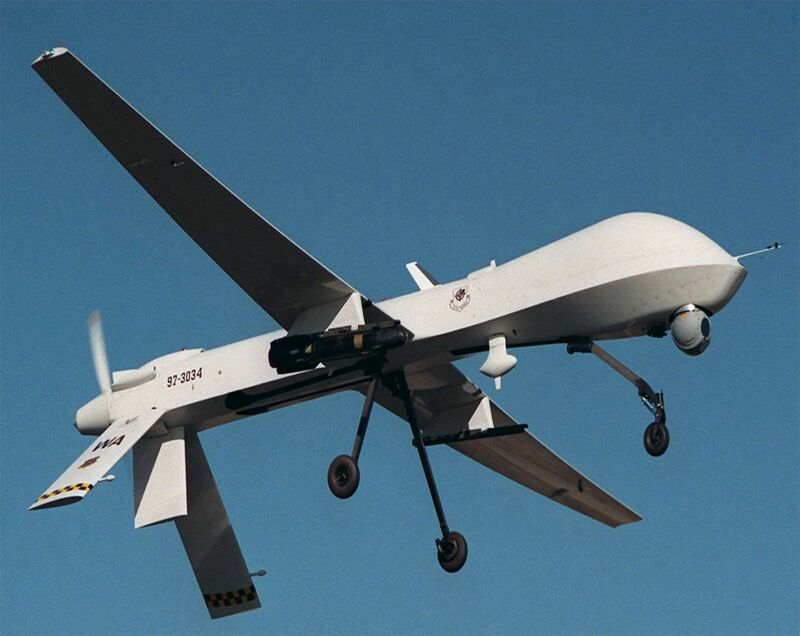 Are unmanned aircraft, known to have difficulty avoiding collisions, safe to use in America's crowded airspace? And would their widespread use for surveillance result in unconstitutional invasions of privacy? Experts say neither question has been answered satisfactorily. Yet the federal government is rushing to open America's skies to tens of thousands of the drones - pushed to do so by a law championed by manufacturers of the unmanned aircraft. The 60-member House of Representatives' "drone caucus" - officially, the House Unmanned Systems Caucus - has helped push that agenda. And over the last four years, caucus members have drawn nearly $8 million in drone-related campaign contributions, an investigation by Hearst Newspapers and the Center for Responsive Politics shows. The Federal Aviation Administration has been flooded with applications from police departments, universities and private corporations, all seeking to use drones that range from devices the size of a hummingbird to full-sized aircraft like those used by the U.S. military to target al-Qaeda operatives in Pakistan and elsewhere. Domestic use of drones began with limited aerial patrols of the nation's borders by Customs and Border Patrol authorities. But the industry and its allies pushed for more, leading to provisions in the FAA Modernization and Reform Act, signed into law on Feb. 14 of this year. The law requires the FAA to fully integrate the unmanned aerial vehicles into national airspace by September 2015. And it contains a series of deadlines leading up to that one: This month, the agency was supposed to produce a comprehensive plan for the integration, and in August it was required to have a plan for testing at six different sites in the U.S. Neither plan has been issued. "These timelines are very aggressive," said Heidi Williams, a vice president of the Aircraft Owners and Pilots Association, one of the stakeholders taking part in a working group put together by the FAA to help develop a regulatory plan. "These issues are very complex, and we have a long way to go." Many potential uses for unmanned aircraft, which are cheaper to operate than piloted planes or helicopters, have been identified. Among them: monitoring pipelines and power lines, finding lost hikers, surveying crops and assessing environmental threats and damage from natural disasters. The FAA has predicted that 30,000 drones could be flying in the United States in less than 20 years. An FAA official, who spoke on background, said "one of the main safety issues" with drones is lack of ability to "sense and avoid other aircraft." A September report by the Government Accountability Office identified the same concern. In addition, the GAO report said, "Concerns about national security, privacy and interference with Global Positioning System signals have not been resolved." FAA Administrator Michael Huerta said at a conference on drones this year in Las Vegas that the agency is making progress working through the issues. FAA is working with "collision avoidance experts" from the Defense Department, NASA and private firms to determine what standards and requirements should be set. House members from California, Texas, Virginia and New York on the bipartisan "drone caucus" received the lion's share of the funds channeled to lawmakers from dozens of firms that are members of the Association for Unmanned Vehicle Systems International, Hearst and CRP found. Eleven drone caucus lawmakers from California, where many aviation firms are located, received more than $2.4 million from manufacturers' political action committees and employees during the 2012 and 2010 election cycles, according to an analysis of Federal Election Commission reports. And eight Texas House members in the caucus received more than $746,000. Rep. Henry Cuellar, D-Laredo, said drone manufacturers contribute just as other interest groups do. "We get contributions from media PACs, from teachers, from doctors and from a whole lot of companies that produce drones," Cuellar said. The House "drone caucus" was established three years ago. Senate lawmakers followed suit this fall. Cuellar also said the purpose of the House caucus is to educate other members on the need for and uses of drones for public safety, border enforcement, search-and-rescue and commercial uses. The Association for Unmanned Vehicle Systems International, which represents drone and systems manufacturers, has been far more generous to Republicans than Democrats when it comes to campaign donations. GOP drone caucus members received 74 percent of the group's donations. In the House, the top recipient was Rep. Howard "Buck" McKeon, R-Calif., chairman of the House Armed Services Committee. He received $833,650 in drone-related campaign contributions. McKeon and Cuellar are co-chairmen of the caucus. Rep. Silvestre Reyes, D-El Paso, a former U.S. Border Patrol sector chief who lost his seat in the Democratic primary, received $310,000. Rep. Michael McCaul, R-Austin, chairman of the House Homeland Security subcommittee on oversight, received $100,000, and Cuellar received almost $77,000. The two have pushed for drone surveillance of the U.S.-Mexico border. Companies with drone aircraft currently used by the military, but with potential civilian applications, were among the largest donors to caucus members. Those firms include BAE Systems, which makes the Mantis and Taranis drones; Boeing Co., maker of the hydrogen-fueled Phantom Eye; Honeywell International, maker of the RQ-16 T-Hawk; Lockheed Martin, which makes the RQ-170 Sentinel; Raytheon Co., which makes Cobra; and General Atomics, maker of the Predator. Some lawmakers remain skeptical. Along with civil rights advocates, they worry over government eavesdropping, surveillance photography and other potential privacy violations. "The drones are coming," shouted Rep. Ted Poe, R-Humble, earlier this year from the House floor, as he warned of encroachment by government into the rights of citizens. A North Dakota court upheld the arrest of a Lakota, N.D., farmer by a police SWAT team using information from a Customs and Border Protection Predator drone over the northern U.S.-Canadian border. The June 2011 incident began when several cows found their way to Rodney Bossart's 3,000-acre farm. He claimed ownership of the wayward bovines and allegedly brandished firearms at law enforcement officials. During the ensuing standoff, a SWAT team received surveillance information from Customs and Border Protection, gathered from a high-flying Predator drone. That information was used to locate and arrest the farmer. The Bossart case was apparently the first use of national security surveillance to aid the arrest of a U.S. citizen on non-terror-related charges. More such cases should be expected, said Jay Stanley, a senior policy analyst with the American Civil Liberties Union. "Based on current trends, technology development, law enforcement interest, political and industry pressure and the lack of legal safeguards - it is clear that drones pose a looming threat to Americans' privacy," Stanley said. Law enforcement agencies say drones will better protect the safety of officers and the public in dangerous situations, and can be used for search and rescue during natural disasters. Last year the sheriff of Montgomery County, north of Houston, purchased a $300,000 Vanguard Shadowhawk- a small unmanned helicopter - with a grant provided by the Department of Homeland Security. But deputies have yet to use the drone, mainly because of FAA restrictions, said Randy McDaniel, the Montgomery County chief deputy. The FAA limits, as well as maintenance costs, battery-life problems and poor video quality, prompted the Texas Department of Public Safety to discontinue its $298,000 drone program in 2010. The four hand-held drones were used in fewer than 10 missions in two years. Law enforcement officials are lobbying lawmakers to shift the oversight for use of drones from FAA to the Department of Homeland Security. That position is supported by McCaul, who said DHS has more familiarity with drones and is best equipped to handle a potential risk of hijacking by terrorists. He's alarmed at the lack of federal preparation for the influx of drones, particularly in light of the Sept. 11, 2001, terrorist attacks. The privacy issue bothers both Democrats and Republicans. This year's Republican platform stated: "… [W]e support pending legislation to prevent unwarranted or unreasonable governmental intrusion through the use of aerial surveillance ... with the exception of patrolling our national borders." The Fourth Amendment governs when, where and how the government can gather information on an individual, including whether officials need a search warrant before acting. Courts have given the greatest protection to people when they're in the privacy of their homes. For instance, in a 2001 Supreme Court case, the justices nixed the Interior Department's use of thermal imaging to detect heat patterns coming from the home of someone suspected of growing marijuana indoors using heat lamps, saying it was an illegal search and required a warrant. The court's reasoning relied in part on the fact that the technology was not in "general public use." That's language that might be applicable to drones using cameras to get glimpses of individuals inside their homes. Outside a home's walls, though, privacy rights decrease. Courts blessed an arrest after a flyover by police revealed marijuana growing in someone's back yard. Liberal Rep. Ed Markey, D-Mass., and libertarian-leaning Sen. Rand Paul, R-Tenn., have crafted legislation to put a tight rein on drone use. Privacy advocates note that not just the police, but individuals and commercial enterprises will be using the devices. Paparazzi are already using small drones on the Riviera to shoot photos of celebrities in otherwise hard-to-access areas.